The joys of restaurant opening season are offset by the teary eyes of The Shutter, your regular dose of closings around town. As always, if you notice a place that has recently closed its doors, do share. 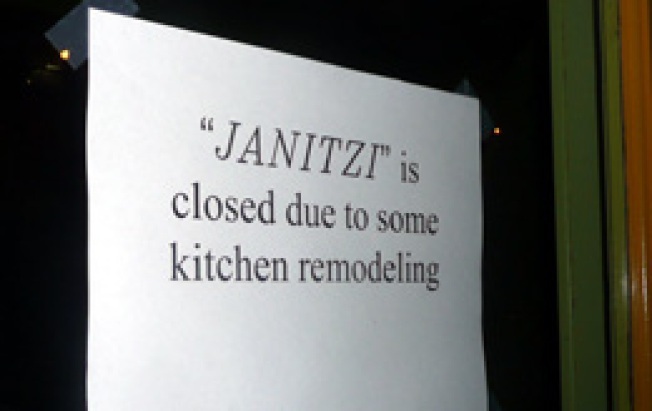 The Mission: Nary a month after opening, "cuisine of the Americas" bistro Janitzi has shuttered, albeit temporarily. The reason given for the hiatus is "some" kitchen remodeling; whether or not that's true is unknown, but we are hearing that the closure is probably indeed a quick pause. Regardless, it's not an encouraging sign for Janitzi, which in its first four weeks of restaurant life, hasn't done anything—read: it hasn't pulled any crowds thus far—to show that it can break the curse of that Valencia Street space, which has already claimed the likes of Senses, Watercress and Watergate in recent years. Those $3 lunch specials might not be cutting it.